The Manuscript, collage, SG, 2011. So, says Blaise, let us sum up what we know about the Book so far. Vivian, Corwin and Blaise are seated in the Hall. Light is streaming through the high leaded windows that throw a multicolored glory onto the rough stone pavement. To Vivian´s surprise, by day the huge Hall does not seem as oppressive as she remembered. Hearing her thought, or deciphering her mood, which is not very difficult, Blaise smiles at her. The Elves have added and painted these high windows, that is why the Hall seems more…cosy. Corwin is standing at the big oak table near the fireplace, on which the fragments of the Book have been carefully placed. He caresses his beard in a reflective way. We have these fragments. 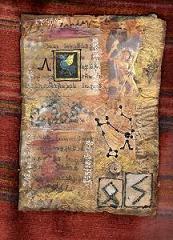 A piece of map, very damaged; a page of a manuscript, and what the Elves may have told you about it all. Master Blaise, what do we actually know? Blaise rises from his seat, goes to the massive table, and takes up the faded page. Well, the Elves have examined this and told us two interesting things: one, this sign here, in the corner, is a Lambda. It is the sign that Vivian drew in the air yesterday. As you can see, it looks like an A without the middle bar. And this here, he shows something to Corwin and to Vivian, who, having risen from her chair, is now standing close to the oak table too, this here, Blaise goes on, is a drawing of a constellation that we have deciphered as being the Constellation Draco. Draco, of course, means dragon. Draco is a constellation in the far northern sky of real-Earth. Draco is circumpolar (that is, never setting) for observers in the northern hemisphere. 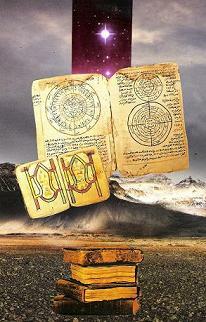 One of its stars, indicated on the fragment of the Book, is called Giausar (Jo-sar), see here? It is emphasized on the drawing. This star is otherwise called…Lambda Draconis! So we can surmise that the Wanderers came from this galaxy, maybe from a planet around this star, Giausar. The language on this fragment is ancient Tibetan. It is not of extraterrestrial origin, so it might be deduced that this book, of which this fragment is a page, is a copy. What does the text say? asks Vivian. It is an ancient philosophical text about the Sky Dancers, the Flying Dakinis. It seems that the real-Earth Tibetans are the direct descendants of the Khandromas, and as such, a lot of their culture points to the Wanderers. Particularly, their art and their chants, which, of course, are well-known. So, to recapitulate what we know, we know or surmise where the Wanderers came from, we know a bit how they must have looked like, and what their philosophy might have been. Though, of course, all these things have changed a lot through time. The fact that the Elves could actually unlock the text means that the Book, of which this page is a surviving fragment, is a late copy, probably from the early real Earth´s Middle Ages. Do we have an idea about where this copy might be right now? And why it is so important? Yes, says Blaise, we do have an idea of where a copy might be, and the Book is important because it probably contains very valuable information about the genetic manipulation that was done, and how to speed it on. At least we hope so. There is a legend in Midgard that the Lord of the Darkwoods had a copy stolen from the tribe that lives around Mount Tsarang. Blaise picks up the other tattered fragment. As you can see, this fragment shows Northern Midgard. You can still clearly see Dolphin Bay, which is an easy landmark to recognize, and the Asmat Coastline. And here is the lower part of Druid Island. And here, you can still distinguish Lake Evendun and the beginning of the Great Desert. This faded sign down here in that corner is a Lambda, and it corresponds to the exact place where on a contemporary map Mount Tsarang is located. Mount Tsarang is a rather mysterious part of Elvenland, we do not know a lot about it, except that it is not only mysterious, it is also known as being dangerous. Blaise now unrolls a big map on the table, putting his finger on it, on a central spot. Vivian and Corwin each seize a side of the map to flatten it. We can go to this place right away, in a straight line, and maybe even find the Watcher himself. Oh, that would be easy indeed, Master Blaise glances at Corwin. He looks very serious, even gloomy. But we do not need the Watcher. He can wait some more. If he still exists at all. What we need is the Book, the stolen copy of the Book. And the only place where such a copy could be found, if it is not only a legend, is… the Darkwoods. You both know what that means. Vivian and Corwin look at each other, dumbfounded. Blast me to the heathen heavens, swears Corwin, usually a better educated person. Never better said, adds Vivian, raising her eyebrows over startled eyes. …You want us to go into the Darkwoods and look for the Book? Master Blaise nods, That is correct.